Namaste All Prajapatio Wish you a Happy & Prosperous New Year Happy Diwali & Happy New Year From, Shree Prajapati Vidhyarthi Ashram Prajapati Institute of Information Technology Shree Prajapati Young Social Group Shree Prajapati Mahila Mandal Kumbhkar Co. Op. Sevings & Credit Soc. Ltd. Bilimora. 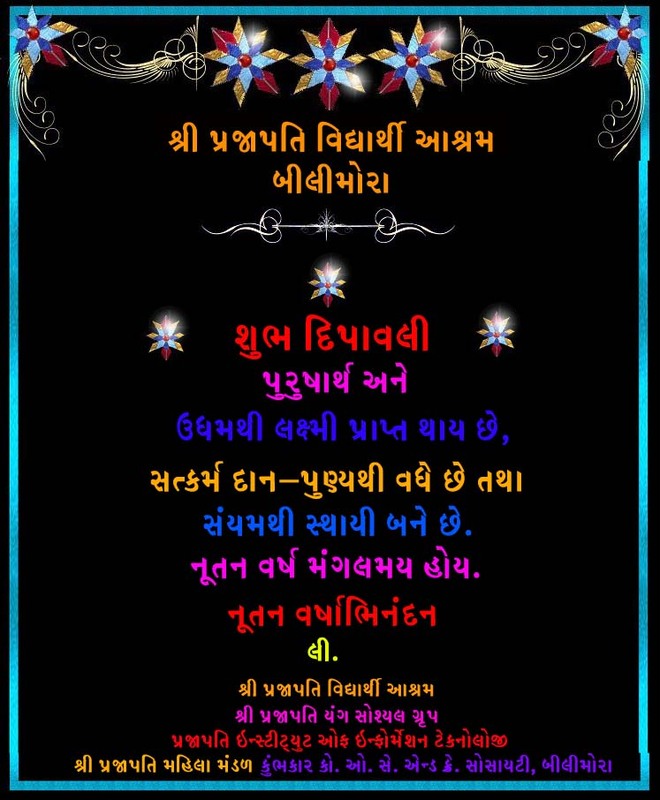 Happy Diwaali and Saal Mubark to all Prajapatio’s of Surat District, Navsaari dist, Valsaad dist. We wish all the success to our Computer Centres at Billimora, Navsaari, Surat, Valsaad, Vaapi and Bardoli.